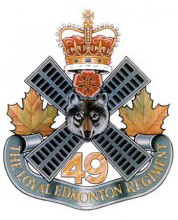 As an infantry regiment in the Canadian Forces Army Reserve, The Loyal Edmonton Regiment offers unique and challenging part-time employment opportunities to Canadian citizens. We are always interested in welcoming new members to our unit in a variety of positions. If you are interested in getting involved with the Army Reserve and want to gain valuable experience and training, review the criteria below and contact a recruiter today! Be free of any legal obligations. For details on what it means to be an infantry soldier/officer click on the following links. Be sure to look at the Part-time Option tab. Bandsman: For details go to the Regimental Band page on this site. Contact the local unit recruiter and make an appointment. See our Contact Us page. Complete all the required application forms and provide all required documents. Complete a basic aptitude test and a fitness test. If you pass all previous components, your file will be sent to Ontario for reliability and security screening. If you are cleared for enrolment, the unit recruiter will contact you to give you an enrolment date and start date for basic training. This process can take several months. The unit recruiter will advise and assist you throughout the entire process. For further details on the process go to the following site. Note that the site describes the regular force process. The reserve force process varies in several ways. We train on Wednesday nights 7 to 10 pm during the training year (September to May) as well as some weekends. Some phases of your more advanced training may be conducted a various military bases in Canada and involve extended full-time periods. Your initial training will include the following courses. The first stage of training is the Basic Military Qualification (BMQ) Course. This training provides the basic core skills and knowledge common to all trades. On successful completion of the BMQ, you will go on to the Soldier Qualification (SQ) Course which provides the individual skills and knowledge more specific to the infantry soldier. After the SQ course follows the Basic Infantry Qualification (BIQ) Course, which expands further on individual skills and knowledge and also adds infantry section and platoon tactics. See our Contact Us page. Be sure to phone the recruiting office first to confirm the availability of a recruiter and make an appointment.